As this years trip approaches I went back and looked at last years trip. It was fun to look back at the pics so thought I would post a few. 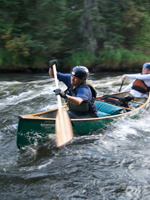 We ran the upper Clearwater river August 2010. We took back roads that allowed us to skip most of Lloyd lake. We then paddled down to the bridge over the 955, with a rest day at the virgin river. I had paddled this route 15 years earlier so it was great to paddle again. The water level was very low so it was a lot of bump and slide over shallow rapids searching for the deepest channel, but a great trip none-the-less. If I can find the video I will post it as it gives a better idea of the really unique terrain of the upper Clearwater. Thanks! Great pictures. It looks like nice country. I have a couple of questions about logistics for this portion of the Clearwater. How many days did you spend on the river? How did you arrange your shuttle? We planned for seven days but did the trip in six days. We cut some time off at the beginning by skipping some of Lloyd lake. Also, because the water was so low, we were able to turn the 1.3 km portage around the gorge/falls into a 100m portage; we ferried the boats across the gorge below the falls, and shot about half of the remaining rapids. After that, we then lined the rest of the way which was a huge time saver. As to the logistics, one of our paddlers works in Buffalo Narrows, so we all met at his place. 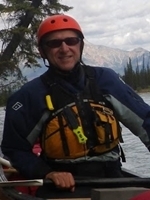 He had made a contact with one of the school teachers in La Loche who is an avid paddler and had done the upper and lower clearwater many times. The teacher was nice enough to drive us up, and store our vehicles on his yard while we paddled. He then picked us up at the bridge over warner rapids (there is also a campground there; you could spend the night, but it is a bit of a party spot so we got picked up that day). If you want some contact info of people who can help, send me a PM. I believe the RCMP in La Loche may allow you to park in their compound if they are contacted ahead of time. If you are into fishing make sure you bring some flies for the arctic grayling on the virgin river. The water is so clear you can see them sitting on the bottom of the river and watch them strike the surface for bugs floating by. We had the best luck for grayling in the evening. Awesome stuff. This trip is on "the list". Not this year, maybe next. Ya, it is a great trip - one of the best rivers that has good road access. Clearwater is also on my "to do" list. I would really like to do both the upper and lower sections in one trip. Like Pawistik, my trip will have to wait at least a year or two.